Thank you to the many institutional partners who support Thresholds. We would like to extend a special thanks to the featured institutional partners below. The Polk Bros. Foundation was established in 1988 thanks to the success of the Polk Bros. chain of retail furniture and appliance stores, a Chicago institution for more than 55 years. The foundation has given more than $300 million to support organizations that provide access to quality education, preventive health care and basic human services for all Chicagoans, as well as to strengthen the city’s diverse arts community. Through a four-decade-long partnership with Thresholds, the Polk Bros. Foundation has positively impacted the lives of thousands of people struggling with mental illness. In recent years, the foundation has provided invaluable financial support and guidance for Thresholds’ Grais Apartments, a staffed residence offering innovative treatment and recovery services for people who are homeless with co-occurring severe mental illness and substance abuse conditions. 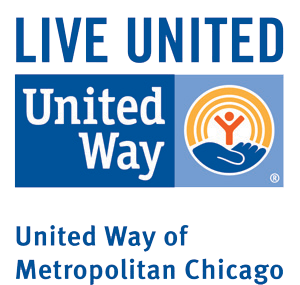 United Way of Metropolitan Chicago (UWMC), founded in 1932, works to resolve pressing community issues by linking together schools, government agencies, businesses, and human service providers through giving, advocacy, and volunteer initiatives. UWMC focuses specifically on financial stability, access to healthcare, and educational achievement. Through a multi-year funding commitment of Thresholds’ Supported Employment Program, UWMC is helping thousands of people with severe mental illness find and maintain jobs in competitive workplace settings. VNA Foundation was founded in 1890 as the Visiting Nurse Association of Chicago, an organization that employed its own nurses to provide health care to the underprivileged. Among its founders was pioneering social activist and Nobel Prize winner Jane Addams. Since 1995, however, the VNA Foundation has not provided direct nursing services. Instead, VNA has operated exclusively as a grant-making foundation, giving financial support to nonprofit organizations offering home- and community-based care to the medically underserved. Thresholds is thrilled to be working with the VNA Foundation in developing the new Women Veterans Health Project. This new initiative, which launched in July 2013, provides comprehensive services tailored to the unique needs of a rapidly growing population: women veterans who are low-income and struggle with post-traumatic stress syndrome/mental illness. The VNA Foundation has provided seed funding for the program, as well as ongoing assistance and expertise. Together, along with the VA and other social service organizations, Thresholds and the VNA Foundation strive to raise the bar nationally for providing women-centered, veteran-focused services. The Robert R. McCormick Foundation is a national charitable trust whose philanthropic mission is carried out through four program areas: communities, journalism, education and citizenship. Founded in 1955 by long-time Chicago Tribune owner, editor, and publisher of the same name, the foundation is one of the nation’s largest public charities, having granted more than $1 billion to non-profit organizations across the country. In 2010, The McCormick Foundation provided seed funding to help launch Thresholds’ Veterans Project, which provides comprehensive services for military veterans struggling with mental illness and high rates of homelessness. Thanks to the foundation’s ongoing support and expertise, the Veterans Project has grown significantly and now serves 300-plus veterans annually.